The Estoril limestone fireplace is made from natural Portuguese limestone that is cut straight from the earth. With characteristic darker veins and a lighter background, intermingled with fossils and blooms the Estorill fireplace cannot fail to make a bold statement. The fireplace is manufactured from 100% natural material. How can chips in the surface or edges be repaired? Chips on edges can be removed by filing a chamfer on the edge. Chips elsewhere can be filled using a mixture of "plaster of paris" ( any brand, such as Polyfilla ) and blending with a water based colourant such as paint or even garden soil to match the colour. When dry, sand down smooth with fine sandpaper and wire wool for a smooth finish. How can scuff marks be removed or cleaned? Use fine sand paper and wire wool on the affected area to remove the scuff. How can the surround be cleaned or polished? For general cleaning, use a damp cloth with clean water and wipe down entire panel / surface to ensure no water marks when dry. For stubborn stains, use a solution of washing soda or "Lithofin Wexa" multipurpose stone and tile cleaner. How can the limestone surround be sealed or protected? Use only correct sealer such as "Lithofin Stain Stop" to ensure it drys out with a matt / satin finish. Do NOT use exterior stone sealers as this will damage the finish of the product and may emit harmful fumes in confined spaces. How do I install or fasten down the limestone surround? 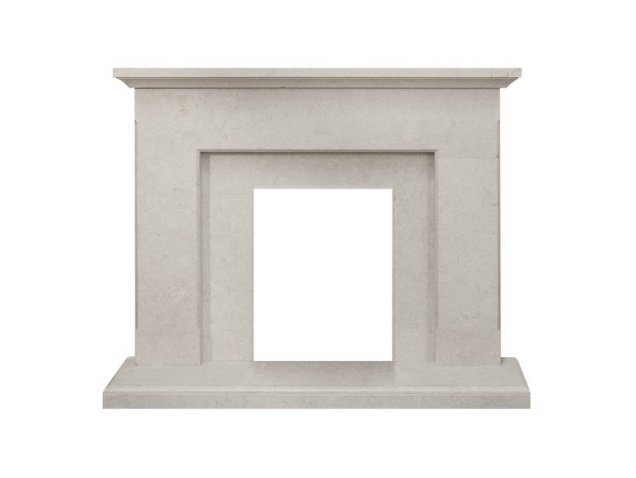 The natural features of the limestone surround give it that extra individual feeling. Mine has a fossil on the mantle top - looks great!